Adversity isn’t such a bad thing. Just look at Edina. At the start of the season, the Hornets weren’t expected to be particularly good. At least not by Edina’s lofty standards. They were outside the top 10 in the state rankings and out of any discussions about state title contenders. Edina went 1-1-0 at Wayzata’s season-opening tournament. Then came a perfect 9-0-0 December. 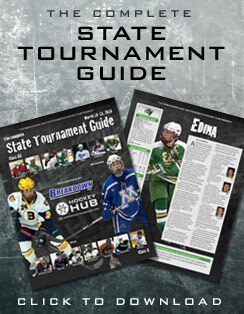 At one point the Hornets, who beat state tournament entrants Duluth East and Blaine and eventual section finalists Elk River, Woodbury and Eden Prairie during their sizzling December, were as high as No. 2 in the state rankings. The Hornets’ followed their meteoric rise with a 2-4-2 January plunge, knocking them out of the state’s top 10 once again. But they wouldn’t be down for long. A strong finish to the regular season included a stunning victory over Minnetonka (the Skippers’ only loss this season). A tough 3-2 section semifinal win over Holy Angels was followed by a dominating 4-1 triumph over Bloomington Jefferson in the section final. The Hornets are back. Back to where they were in December, back in the state tournament for the 32nd time. 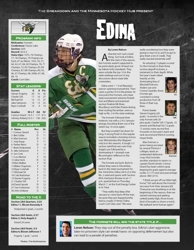 Edina (20-6-2) is the No. 2 seed and opens with Section 8AA champion Roseau in an 11 a.m. quarterfinal on Thursday, March 11 at the Xcel Energy Center in St. Paul. An amazing 13 players scored for the Hornets in their three section playoff victories, a testament to their depth. While last year’s team relied heavily on the dominating line of Marshall Everson, Anders Lee and Connor Gaarder, these Hornets get consistent scoring production from all three of their top lines. Points leader Steven Fogarty (20 goals, 16 assists) is the only Hornet with 20-plus goals. Charlie Taft (17goals, 10 assists) and Michael Sit (12 goals, 15 assists) were second-line forwards on last year’s team and rank second and third in scoring, respectively. Max Everson, a junior being recruited by several Division I colleges, leads an underrated defensive corps that includes another standout in senior cocaptain David Jarrett. Connor Girard has been solid in goal, keeping his goals-against average under 2 (1.77) and save percentage above .900 (.915). beginning of the season, then we started winning and getting ranked pretty high, those losses kind of brought us down a notch.